The Bureau of Reclamation, in conjunction with South Dakota Game Fish and Parks, has prepared a draft Resource Management Plan (RMP) for Shadehill Reservoir. 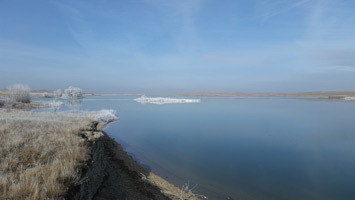 Reclamation is the federal agency responsible for administering lands and resources associated with Shadehill Reservoir. The RMP is intended to document current management practices and policies at Shadehill. The RMP will help ensure that future management decisions are consistent with Reclamation’s management objectives and authorized purposes, as well as with growing public demand for recreation, water development, and environmental protection. The RMP presents future use, management, and development of Shadehill Reservoir lands. The RMP does not address Shadehill Reservoir water operations or irrigation. We would appreciate your review and comments on the draft RMP. The review period will be open until March 15, 2019. Comments may be submitted in writing to: Andrea Gue, Dakotas Area Office, P.O. Box 1017, Bismarck, ND 58502-1017, email ague@usbr.gov or by calling 701-221-1223. Finding of No Significant Impact and Final Supplemental Environmental Assessment for the Funding of Routine Operation, Maintenance, and Replacement of Associated Water Transmission Facilities of the Mni Wiconi Rural Water Supply Project, South Dakota. Hard copies of the Final SEA and FONSI may be obtained by calling Kate Kenninger, Natural Resource Specialist, at 701-221-1282 or by requesting in writing from Area Manager, Bureau of Reclamation, P.O. Box 1017, Bismarck, North Dakota, 58502. Environmental Assessment and FONSI for the Funding of the Northeast Regional Water District Phase II Project: Cavalier, Pembina, Walsh, Ramsey, Towner, and Benson Counties, North Dakota. Hard copies of the Final EA and FONSI may be obtained by calling Kate Kenninger, Natural Resource Specialist, at 701-221-1282 or by requesting in writing from Area Manager, Bureau of Reclamation, P.O. Box 1017, Bismarck, North Dakota, 58502. Final Environmental Assessment and FONSI for the Issuance of a Water Service Contract to Garrison Diversion Conservancy District for the Central North Dakota Water Supply Project, North Dakota. Hard copies of the Final EA and FONSI may be obtained by calling Kate Kenninger, Natural Resource Specialist, at 701-221-1282 or by requesting in writing from Area Manager, Bureau of Reclamation, P.O. Box 1017, Bismarck, North Dakota, 58502. Final Environmental Assessment and FONSI for the Funding and Construction of the Heart Butte Conduit Repair, Grant County, North Dakota – Hard copies of the Final EA and FONSI may be obtained by calling Kate Kenninger, Natural Resource Specialist, at 701-221-1282 or by requesting in writing from Area Manager, Bureau of Reclamation, P.O. Box 1017, Bismarck, North Dakota, 58502. Final Environmental Assessment and FONSI for the Funding of the Construction of the Cass Rural Water District Leonard Area Expansion, Cass, Ransom and Richland Counties, North Dakota – Hard copies of the Final EA and FONSI may be obtained by calling Kate Kenninger, Natural Resource Specialist, at 701-221-1282 or by requesting in writing from Area Manager, Bureau of Reclamation, P.O. Box 1017, Bismarck, North Dakota, 58502. The Dakotas Area Office is responsible for administering Reclamation programs in North Dakota and South Dakota. The Area Office is located in Bismarck, North Dakota, with two field offices in South Dakota. The Area Office manages nine dam and reservoirs, three of which are in North Dakota. Activities include operation and maintenance of Reclamation facilities; contract renewals; water conservation; and oversight of the construction, and operation and maintenance of rural water systems – including those for tribes in the two states. Reclamation projects in both states provide a water supply to a total irrigated acreage of 97,000 acres producing an average of $16 million worth of crops annually. Municipal, rural and industrial water supply projects will serve over 700,000 people when completed. Over a million visitors participate in recreation activities in Reclamation reservoirs in the states. Red River Valley Final Report on Water Needs and Options (all files require Adobe Acrobat, and open in a separate window). Download a complete zipped copy of the CD (130 MB).